2018 Is Now The Wettest Year On Record For Washington And Other Cities So far this year, 61.34 inches of rain have fallen in Washington, breaking a 129-year-old record. Floods in Ellicott City, Maryland, pushed cars into a pile last May. This year has been a year of record rainfall for cities throughout the mid-Atlantic and Carolinas. Washington has already seen 122 days with measurable rain in 2018, reports The Washington Post, and the precipitation has led to floods throughout the region. The Potomac River rose to flood stage three times this year. In each of the three instances, The Washington Post reports, "The water level ranked among the top 75 crests in records that date to the 1930s." Washington is not alone in experiencing heavy rainfall this year. 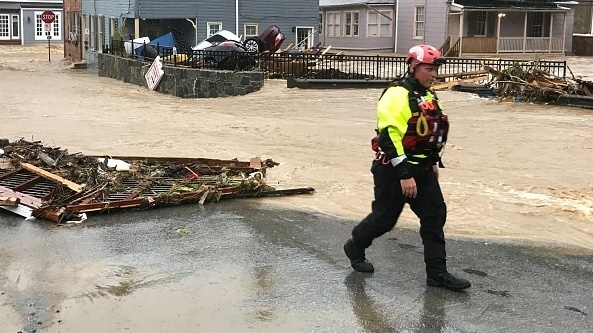 Dozens of other locations have reported record-breaking precipitation, including the cities of Baltimore, Philadelphia and Wilmington, North Carolina. The rainfall also caused devastating floods in Ellicott City and Frederick, Maryland earlier this year. The wet weather has impacted communities in the mid-Atlantic and Carolinas the most. "Where has the most precipitation fallen? A co-op in Wilmington, N.C., has logged 105.56 inches this year, while another on Grandfather Mountain reported a record 100.82 inches. Other exceptionally wet locations include Tucker, W.Va., and Marion, N.C., both of which topped 90 inches. Dalecarlia Reservoir, a co-op in the District, has picked up 68.74 inches." In addition to the rain, the weather has also been unusually frigid on the East Coast. November was the coldest on record for Washington since 2014 — the average temperature was 3.1 degrees colder than normal. The Washington Post reports that a jet stream has brought "moisture-packed storms," and that some of the wet and chilly weather might be due to climate change. "Although scientists hesitate from attributing the rainfall in a single year to climate change, an increase in heavy precipitation is an expectation as the planet warms. Washington's temperatures have risen over time and 2018 is on track to rank among the top 10 warmest years on record," according to The Washington Post. Scientists say that as the climate warms, extreme rainfalls concentrated during short periods of time are likely to increase. As the National Center for Atmospheric Research writes, "climate models project this lopsided distribution of rain and snow is likely to become even more skewed by century's end, with half of annual precipitation falling in 11 days."